Use a hair dryer stand to give yourself a blowout...or have a windblown photoshoot. The elusive perfect blowout. The skill that seems to come so easy to stylists in salons can be pretty tricky to replicate at home. One way to make it a little easier on yourself? Adding a third hand. And maybe even a fourth, so you can check your email on your phone. A fifth could help you sip your coffee. Not to mention how much higher your average words-per-minute typing would be. Okay, we’re getting carried away. While bionic arms are not yet available (to the general public, at least), a hair dryer stand could help you in your first pursuit. Target sells a hair dryer stand for $14 — a small price to pay for freedom to use both of your hands maneuvering that bulky round brush through your hair. 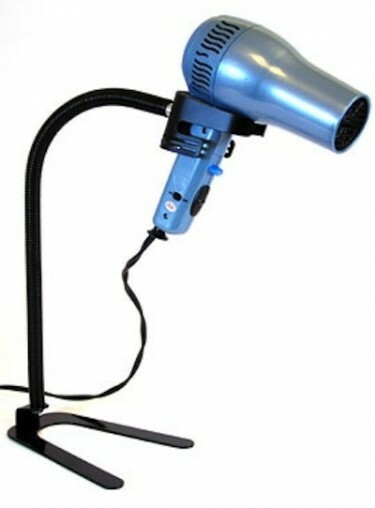 Not ready to invest in a hair dryer stand? You can still style with free hands by trying these 10 blow dryer-free hairstyles.